So, I know I said I wanted to master a good summer dessert recipe. I am not considering this to be it, since when I think of summer desserts I think of something light and cool. 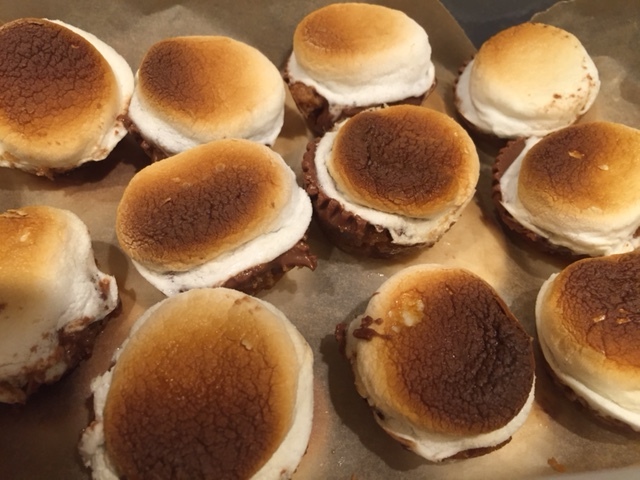 BUT — I made these s’mores bites for a potluck at work, and they were a HIT. People loved them, and they went fast. The best part? They were SO easy to make. Preheat oven to 350 degrees and spray your mini muffin pan with non-stick spray. I don’t know if you can buy graham cracker crumbs at the store or not, but if you can I would just do that. I had full graham crackers, so I took 3 graham crackers and crushed them up to as small pieces as I could get in a medium sized bowl. You want just about 1 cup of graham cracker crumbs. Mix in the melted butter and powdered sugar. Distribute the mixture to the 24 mini muffin cups. Press down on the middle of them to make an indent so it’ll be a “cup” form. While that is baking, cut 12 large marshmallows in half and unwrap your Reese’s. Remove the pan from the oven and place one Reese’s (or you can also use 1-2 sections of a Hershey’s bar) in the graham cracker cup and cover it with 1/2 marshmallow (the cut side facing down). The chocolate will begin melting quickly, that is fine. Turn your oven on broil. Put the pan back in the oven for about 2 minutes. Watch them — and take them out just as the marshmallows start to brown. Let them cool completely. I’d let it sit for about an hour. Then use a spoon to pop the cups out of the pan.